LÄSSIG’s gym bag Green Label String Bag black is a stylish companion for any occasion. It's is lightweight, water-resistant and durable and thanks to separate additional accessories, it becomes a diaper backpack. Product information "Tyve String Bag, black"
A real must-have. 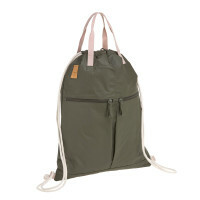 LÄSSIG’s Green Label Tyve String Bag convinces not only with its lightweight, it is also perfect as a multi-functional accessory that can be used for sports, shopping, walks, travel and much more. In addition to the backpack version, thanks to the drawstring cord with its two straps, it also offers a another way to carry the bag. The absolute advantage for parents: due to the included stroller hooks the string bag can also be easily attached to the stroller. In the large main compartment of the gym bag you can fit everything in your heart desires. Two zipped pockets on the front and a hidden zipped pocket on the back side allows you to stow the smaller things you like to have at your fingertips. Keys, cell phone, pens, and the like can be stowed away practically. Lightweight and water-resistant, strong and durable, the Tyve String Bag turns out to be a stylish companion for any occasion. 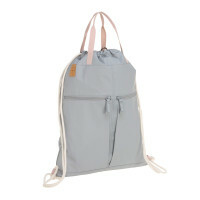 LÄSSIG’s matching diaper bag, Changing Pouch turns the sporty Tyve String Bag into a practical diaper backpack in no time. The innovative outer material Tyvek® from DuPont combines several compelling properties. It is extremely lightweight, tear-resistant, durable and looks great. Thanks to the Tyvek® material, sustainability of these bags doesn’t come up short because this material conserves resources and is easy to recycle.